The government of AP has release the notification for District selection committee (DSC) in WestGodavari.DSC West Godavari has recently announced the notification for the posts of school Assistant for different subjects and Telugu Pandit,Hindi Pandit and Secondary grade Teacher posts in Zilla parishad and Mandal Parishad schools in west Godavari district. 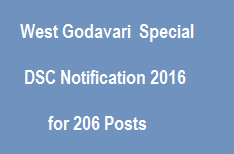 The candidates who are interested in DSC recruitment in west Godavari district they can apply for DSC recruitment. In case of School Assistant, You have to complete your Bachelor’s degree in relevant subjects, B.Ed Degree in Relevant subjects, B.Com in relevant subject or post graduation degree in relevant subject. Incase of Secondary Grade Teacher (SGT), you have to complete your Intermediate in A.P and you have the 2 years D.Ed certificate issued by director of Government Examinations, AP or its Equivalent certificate recognized by NCTE. In case of Language Pundit, you must your Degree or post graduation degree in relevant subjects. 18-50 years for PH candidates. Mode of apply: You can apply Offline mode only. You can pay the fee at SBI branch. Selection processes: Based on Written Test.